Trying to plan the perfect family paddle adventure can be a challenge, especially when you’re trying to accommodate adults and find something that both an 8 year old boy and an 18 year old girl would both think was awesome. My daughter is an amazing young woman, and has been raised in a family fitness lifestyle. She’s still a teenage girl though, and a week-long camping trip in the middle of nowhere without cell service wasn’t something she was initially excited about. We were also trying to plan a trip on a somewhat limited budget, as it was nearing the end of the Summer and we’d already spent our allocated travel budget for the year. 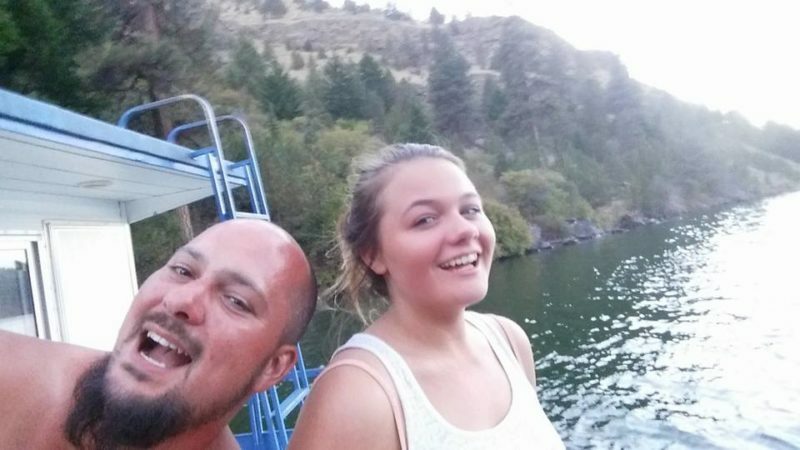 The houseboat idea had been brought up before as a fun sounding SUP trip, but the high rental cost of a houseboat scared us away from ever planning a family vacation based on a houseboat rental. 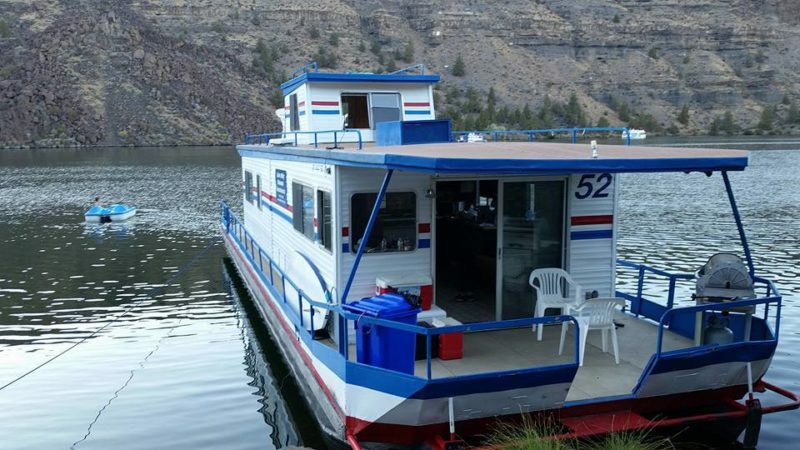 On a whim, I called the houseboat rentals at Lake Billy Chinook Houseboats. Luckily and somewhat amazingly, the price for a 4 day family trip on the houseboat was surprisingly affordable, in part do to it being the end of the summer season. I made our reservations for mid September on Lake Billy Chinook with really no idea of what to expect. The drive to Lake Billy Chinook offered gorgeous views of the Canyons and high desert terrain of the Cove Palisades State Park as the road curved and wound its way down the canyons and finally ended at the houseboat marina. 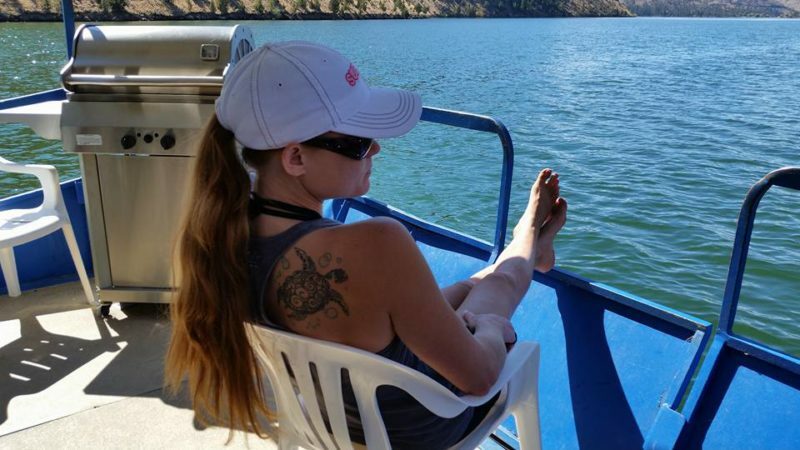 My first glimpse of our houseboat left me second guessing my decision to plan a family trip at Lake Billy Chinook. The houseboats were essentially 1970s single wide mobile homes floating on the water, including veneer fake wood paneling and a coil burner stove with foil placed under the burners reminding me of the budget hotels we stayed at when I was a kid growing up in the 80’s. I could tell my teenage daughter was far from impressed, and although my wife was putting on a good show of being optimistic it was obvious she wasn’t overjoyed with her initial view either. We waited at the marina for about an hour awaiting the arrival of our friends who were joining us for the first night of our houseboat adventure. The lake itself was simply amazing! There were small schools of fish darting around the shoreline and larger Kokanee jumping in the distance that had my 8 year old son more than a little excited to try out his fishing pole. Our friends arrived and we finally got to do our guided walkthrough of what was to be our new home for the next 4 nights. Although the outward appearance had me feeling skeptical, once we actually got a chance to get on board and explore the houseboat all of us were pleasantly surprised and very excited to begin our adventure! My daughter was stoked to find that the upper roof of the house boat was actually a walkable surface. She spent much of this trip on top of the house boat relaxing and enjoying the views as we slowly meandered around the lake. We had a full kitchen including full-size refrigerator, and also a barbecue on the rear deck of the houseboat. At 55 feet long and 15 feet wide, the houseboat was very spacious and easily accommodated our group of 6. The beds were small and not the greatest, but everything was clean and comfortable enough for us to enjoy a good night’s sleep after a long day of play. The houseboat had a top speed of approximately 8 miles an hour at wide open throttle and consistent cruising speeds of only 4 to 5 miles per hour. While we certainly weren’t getting anywhere real fast, there was no real sense of urgency to be anywhere real fast. The entire Lake was beautiful and worth exploring! Tying up the boat for the night prove to be quite the challenge on the first few nights, but by the end of the trip my family and I felt like we were seasoned sailors. Throughout the lake at key points of interest there were large buoys with attachment points that you could moore your houseboat to for the evening. They were surprisingly difficult to maneuver and hold the houseboat close enough to make the moorage connection, especially on one of the windier days. Lake Billy Chinook is also the first body of water I had ever successfully tried fishing from my SUP. What a blast! Casting my line out into the lake while standing on my fiberglass touring board definitely tested the limits of my balancing skills, and was also very challenging and fun reeling in a fat Kokanee while balancing upright on my board. I also caught several fish trolling at a slow paddle across the lake with my fishing pole wedged into the handle slot on my paddleboard. Of course now I realize they offer suction cup fishing pole holders made especially for SUP fishers, but at the time I had never fished from my board before. Fishing somewhere where we actually caught fish made it fun for everyone! Lake Billy Chinook consists of three long fingers and one “thumb”. During our 4 day family SUP vacation, we stayed overnight in a different location every night and explored each different finger of the lake. I can’t say the houseboat was difficult to steer, but I also can’t say it was easy. It moved so slow you had plenty of time to react and correct steering as needed, but it was almost laughably difficult to keep the house boat moving in a perfectly straight line. All of us took a turn being the Captain and steering the houseboat, although I was the official Captain for the duration of our trip. Every morning of our trip when we first woke up, the water was calm and smooth as a sheet of glass! Our morning paddles were calming and serene, and were the perfect way to start each day. The main areas of the lake did get a bit choppy from the winds and the high volume of boat traffic, but we were easily able to find calmer waters to paddle within all the various inlets dotting the shoreline of the lake. 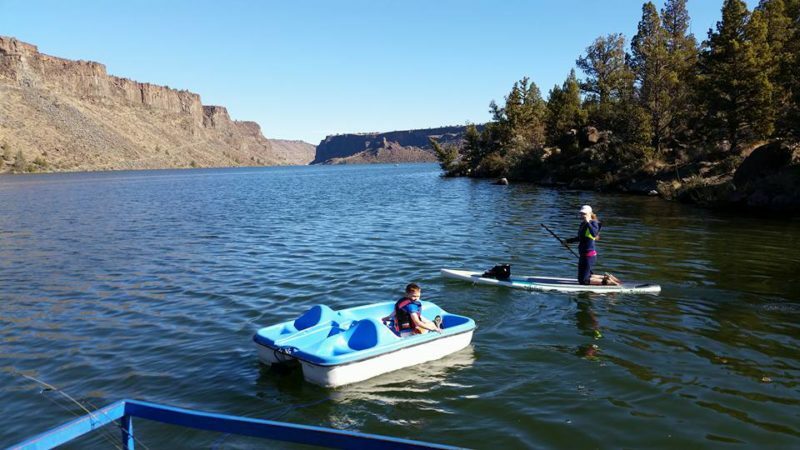 Lake Billy Chinook houseboats make for the perfect family SUP getaway. 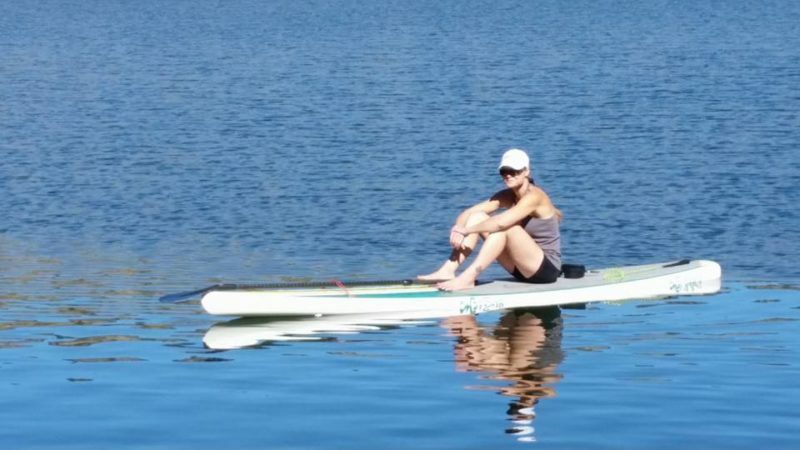 The lake is great for paddlers of all skill levels. For more advanced paddlers looking for more of a challenge, try paddling upriver on the Deschutes where it spills into the lake and test your limits by paddling up the rapids! Please stop by the web sites we adhere to, which includes this one particular, because it represents our picks through the web.